It will cost nearly £20 a month to watch these guys on Sky. And BT broadband customers need to opt-out if they want to avoid the £5 charge from August. Non-BT broadband customers who want to watch the full set of BT Sport channels from August via Sky will need to pay at least £19.99 a month for the privilege. 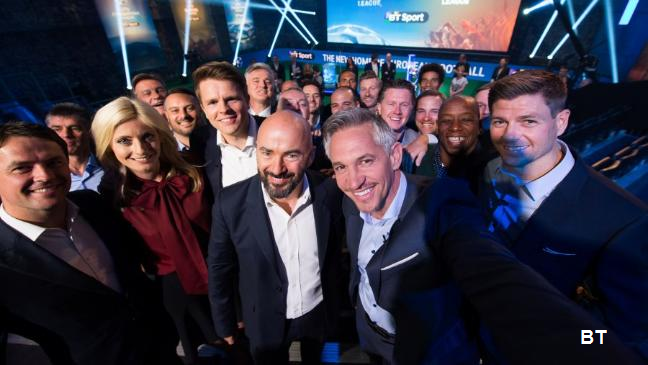 The increase, which was not announced alongside other BT price changes earlier this month, follows the addition of BT Sport Europe to the pack. At £6.49 extra per month, this is more than the £5 a month extra that BT broadband subscribers will have to pay to access the full range of BT Sport content from August. The HD versions of BT's sports channels are available for an extra £4 a month. And viewing via a second Sky box (multiroom) carries a £5 surcharge. BT are currently offering new customers HD and multiroom options for free during the first month, although a £15 activation fee will cancel out the saving. The prices apply to viewers signing up to a 12 month contract. A 1 month contract option, currently at the same price is also available from BT, but without HD or second box options. In addition to BT Sport 1, BT Sport 2, BT Sport Europe and BT Sport ESPN, Sky viewers will have access to 6 BT Sport Extra streams providing extra coverage of the Champions League, compared to 7 BT Sport Extra streams available via BT TV on YouView. BT broadband customers are being sent messages advising them of the changes to the service that start from August. While the initial headlines about BT Sport's pricing from August focused on BT customers paying £5 a month for BT Sport Europe and its coverage of Champions League and Europa League football, in fact the £5 charge is for everything apart from BT Sport 1. Customers will start paying £5 a month for the previously free BT Sport service unless they actively seek to opt-out or 'downgrade'. More details are found in the messages BT is sending to customers. Downgrading involves opting out of receiving BT Sport 2, BT Sport Europe and BT Sport ESPN and moving on to a product BT calls BT Sport Lite, which is just BT Sport 1 (standard definition) on its own and continues to be free to BT customers. Customers switching to BT TV via YouView can continue receiving BT Sport during the 2015/16 season for free, but this is linked to signing up to an 18 month contract. Update 23/06/15: Plusnet will charge £9.99 a month for access to BT Sport via Sky from August 2015. What about Virgin Media customers? BT and Virgin Media are in talks about BT Sport carriage for next season. Virgin Media has confirmed it's getting the new channel. Pricing to be announced. Details on the Virgin Media community forum. I thought rules were put in place to stop companies adding charges without users opting in to them, rather than having to opt out of such charges.